This page is intended as a source of information and education for patients suspected of or having been diagnosed with a brain dural fistula. Please remember the “Disclaimer” — none of this information may be used to diagnose or treat any disease. This is for general information purposes only. Should you need more information, or if you are a patient wishing to make an appointment, you can write to me directly or call the office, both of which are listed in the “Contact Us” section. Our group at the NYU Langone Medical Center is one of the premier neurointerventional centers in the world. The word “fistula” means abnormal connection between two structures that are normally not connected. An arteriovenous fistula is therefore an abnormal connection between an artery and a vein. Any part of the body can have a fistula. Normally, the brain is surrounded by a special tough cover called “dura mater”, or simply dura. When a fistula forms between an artery and a vein within the dura, it is called Brain Dural Fistula, or Brain Dural Arteriovenous Fistula, or BDAVF, etc. When a fistula forms, blood from an artery under high pressure and flow goes directly into a vein, which is a low pressure and low flow structure. Even though the fistula is not directly on or within the brain, it can nevertheless lead to brain dysfunction by congesting the brain venous system, as will be explained below. The reason brain dural fistulas form is usually unclear. They appear to develop spontaneously, — that is without any reason we can point to. Sometimes, a patient has clear history of significant trauma or surgery in the area which later develops a fistula. In most cases, however, we have no explanation why they form, so they are sometimes called “idiopathic”, meaning without identifiable cause. There is in fact a cause; we just don’t know it yet. Typically, the patients with fistula are in 50 years of age or older, and more often are women, but many exceptions to this are seen and really any age or gender can have a fistula. Brain dural fistulas can cause trouble in several ways. Much depends on their location and size. A particularly important symptom — when the patient can actually hear their fistula as a characteristic whooshing to-and-fro sound which is always in rhythm with the heartbeat, — is called “pulsatile tinnitus”. When dural fistulas form near the ear, the patient can actually hear the sound made by the blood rushing from the arteries through the fistula into the veins. As it happens, many dural fistulas form exactly in such a location, in the back of the head behind the ear, near a large brain vein called “sigmoid sinus”. Sometimes the patient is told that they have a “sigmoid sinus fistula”. Many patients can hear the noise of the fistula, which follows the pulse because of the different pressures the vessels experience during the cardiac cycle. The sound ALWAYS follows the pulse; the patient can take their pulse at the wrist and correlate it one-for-one with the sound made by the fistula. The noise is usually louder when more blood flow goes through the fistula, which happens when the heart beats stronger — during of after exercise, stress, etc. The sound is always easier to hear in a quiet place — which practically means in bed at night. It is remarkable how disabling this can be to many patients, who cannot sleep well at night or function during the day because of the noise. A further note on pulsatile tinnitus: Almost all patients who complain to their physicians of a “ringing” in the ear, or “whooshing”, or “tinnitus’ are usually considered to suffer from “tinnitus” in general. This is not to the patient’s advantage, because “pulsatile tinnitus” is completely different from the more common constant ringing in the ears. It has totally different causes, requires a completely different workup, and can often be cured. The trick is not to be lumped into the global group of “tinnitus” sufferers. Pulsatile tinnitus is a almost always a VASCULAR condition, where a normal ear is hearing abnormal blood flow in its viscinity. It is NOT a problem with the ear itself, as is typically the case with constant tinnitus. For a patient with pulsatile tinnitus, being lumped into the overall group of “tinnitus” is very detrimental in terms of getting an appropriate evaluation; it can also make it quite difficult to explain their condition to their loved ones, and interferes with appropriate support. We sometimes ask patients to tell their physicians that “I have a bruit in my head” instead of referring to the condition as a tinnitus, — the word “bruit” immediately clues the physician into some kind of vascular process rather than an ear problem per se, and usually results in a more appropriate evaluation (“Bruit” means a pulsatile sound which is typically heard by a physician with a stethoscope, such as over the carotid artery). Occasionally, fistulas can form in a large venous lake behind the eye called “cavernous sinus” (see case below). 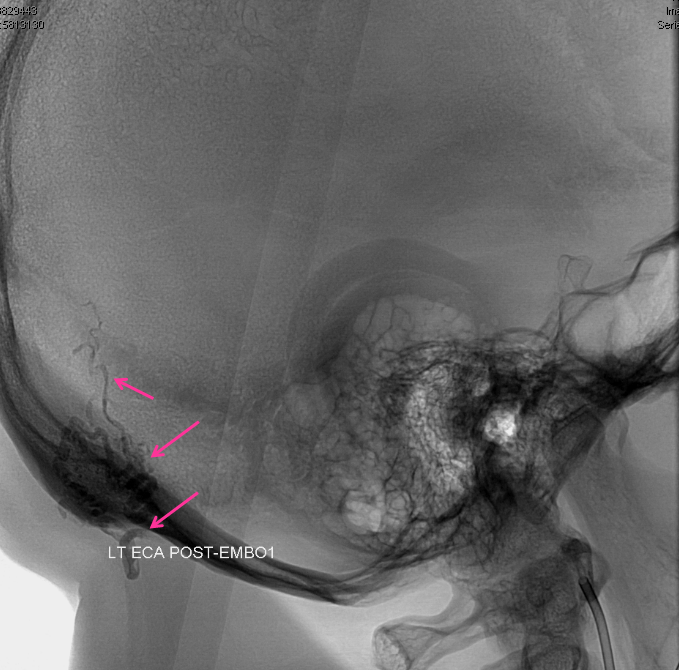 These can be of two types — a direct fistula from the carotid artery to the cavernous sinus called carotid-cavernous fistula, or a dural fistula where the abnormal arteriovenous connection develops between small dural branches of the internal carotid artery (ILT and MHT, for example) and the cavernous sinus. These two are very different, and treated differently. Because the cavernous sinus is normally connected to the veins that serve the eye, the fistula can produce high pressures within the eye veins and eye itself. When this happens, the eye can get large and red and painful. The medical terms for this are orbital proptosis (bulging), orbital chemosis (redness), and ocular hypertension (high pressure). Sometimes, the eye swells so quickly that there is no mistaking something very bad is happening; usually there is lots of panic — it really looks like something out of a horror movie. Other times the process is more gradual. Either way, a trip to the eye doctor is usually the first stop, and most of them can see right away what the problem is. Sometimes the diagnosis takes longer. Needless to say, most patients are very anxious to get the problem taken care of. Delaying closure of the fistula risks permanent eye damage from high ocular pressures, among other issues. Perhaps the worst type of fistula is one that at first produces no symptoms at all. To understand why this kind can be the most dangerous, we have to discuss how dural fistulas eventually cause brain dysfunction. Because the fistula is located on the covering of the brain (the dura), the blood going through the fistula usually empties into the same veins that are normally used by the brain. The sigmoid and cavernous sinuses, for example, are both venous structures which serve as “exits” for blood leaving the brain to return to the heart. When the fistula is small, it usually does not have enough blood flow to cause brain problems. However, as the fistula grows (and it almost always does), more and more fistulous blood gets dumped into the same exit veins as used by the brain. Basically, blood from the fistula competes with blood from the brain for the same exit route. The brain has pretty much the same amount of blood leaving it all the time, but the fistula keeps growing and eventually starts to win the race for the exit. The pressure in brain veins then rises and brain blood has to look for other places where it can exit the skull. At this point, the patient may develop various types of brain dysfunction, such as seizures or strokes. As with pulsatile tinnitus, most patients with seizures or strokes don’t have a dural fistula, but these are some ways a fistula can present itself. Many patients, however, remain symptom-free even at the stage where venous pressures in the brain are elevated. As the fistula continues to dump large amounts of arterial blood into veins which are not used to this much flow or this much oxygen, the veins of the fistula become diseased. This usually means that they get progressively smaller and many eventually shut down completely. While this may seem like a good thing, in reality it is the opposite; once these veins are gone the fistula (which stays very much alive) has to find other veins to drain into. This usually means draining directly into veins of the brain itself. This, of course, is problematic in many ways. The degree of pressure in these brain veins is much higher than when the fistula and brain are competing for the same exit, and the chance of stroke (a bleeding type of stroke usually) or seizures is much higher. Treatment of fistulas at this stage can also be more difficult. A peculiar phenomenon happens — not infrequently — when the patient calls to happily inform us that, suddenly, their pulsatile tinnitus is gone or much diminished. Or that their bulging, red eye has spontaneously improved. This is, paradoxically, not good news: something changed within the fistula, and blood is now going somewhere else. We usually recommend that the patient see us rather soon to discuss the situation. Finally, many patients who have dural fistulas of all sizes and locations can have a myriad of symptoms such as different kinds of headache, tiredness, loss of concentration, memory problems, even hallucinations, psychosis or other psychiatric problems. Unfortunately, in these patients the diagnosis of dural fistula can be significantly delayed because dural fistulas are relatively rare, while the above symptoms are very common and usually not due to a fistula. Finally, fistulas (particularly small ones) can be incidental, or unrelated to any symptom. For example, a patient with headaches and loss of energy may have a fistula, but the fistula may not be the reason for the headaches or energy loss. These kinds of questions can best be answered by a visit to a specialist who is familiar with the condition of dural fistula. The diagnosis of the fistula can be made in various ways, depending on the location, symptoms, etc. Often, the patient can diagnose their own fistula when they hear it or see it (as above). Sometimes, the fistula is found incidentally because of an MRA obtained for some other reason, though this is relatively rare since MRI and CT are not good tests for findings dural fistulas. New MRI techniques, such as time-resolved contrast MRA, are promising to change that, but it is likely that these advances will take a long time to reach the majority of commercial imaging places. 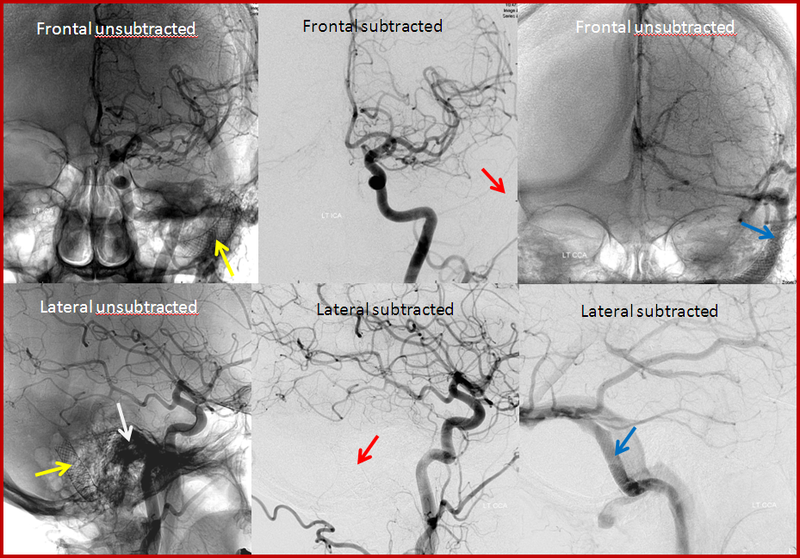 Likewise, new dynamic (sometimes also called 4-D) CT angiographic methods have been studied with considerable success in diagnosis of dural fistulas. The CT techinque has evolved to the point that it is often available outside of research settings, whereas centers that perform dynamic MRA are quite rare. A note of caution in regard to dynamic CT techniques is in order however — CT scanners use x-ray radiation to obtain pictures, and dynamic CT simply means lots of CT scans obtained in quick succession to look at how the pictures change during CT dye injection. A regular one-time CT scan dose to the brain, on a properly calibrated CT machine, is quite low. The total amount of radiation delivered to the patient at conclusion of a dynamic CT scan, however, can be VERY high — in some cases resulting in (usually temporary) hair loss. The long-term effects of such radiation exposure to the brain remain to be determined, but can be potentially troublesome — particularly in younger patients. Anyone offered a dynamic CT scan for any reason should be mindful of these issues and work with their doctor and radiologist to achieve a reasonable balance between radiation dose and useful picture quality. The bottom line is that x-ray radiation images, which come from both CT and angiography, are useful and necessary in diagnosis and treatment of many conditions, including dural fistulas. 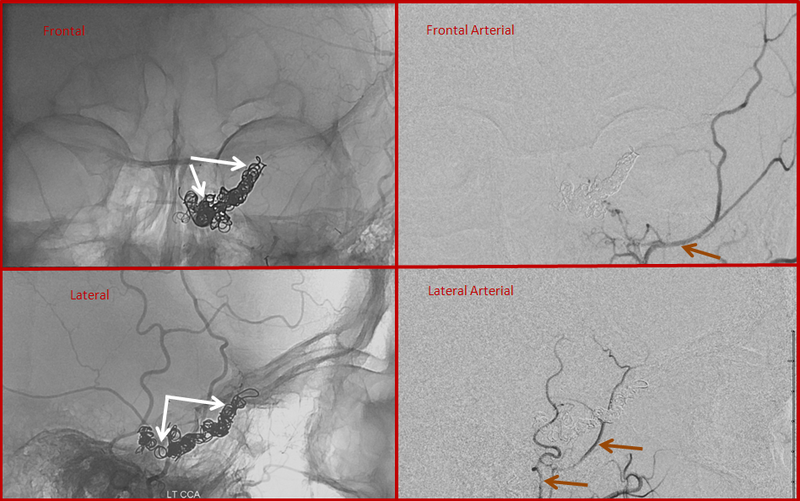 However, everything has its limits, and present-day dynamic CT angiography is pushing moderation to its limits. MRI and MRA, on the other hand, use no radiation, but high quality dynamic MRA is much less generally available at present time than dynamic CT. 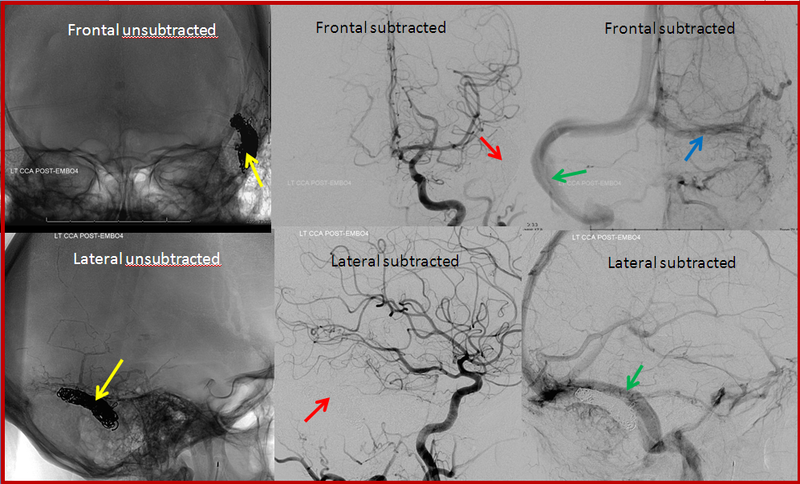 The definitive way of making a diagnosis of the fistula is by catheter cerebral (brain) angiography. During catheter angiography, a skinny but long hollow tube called catheter is placed into the patient’s artery (usually in the leg) and then directed under x-ray guidance into different arteries which go to the brain. A contrast dye is injected through the catheter and the flow of dye through arteries and veins is then imaged by real-time x-ray cameras. The fistula is seen as an area of premature appearance of fistula veins, when normally the dye should still be in the arteries. An angiogram like this usually takes about 1 hour, but practically involves a one day’s hospital stay. There is usually no need to put the patient to sleep for the angiogram, however this varies depending on the facility and preference of the physician perfroming the procedure. The purpose of the treatment is to close the fistula. Two main treatment options are available: catheter embolization and radiation. Catheter embolization is a procedure similar to an angiogram, but more involved and longer. The patient is usually put to sleep by an anesthesiologist. A catheter or catheters are again introduced through an artery and often vein in one or both legs. The catheters are now guided into or near the region of the fistula. Through these catheters we can deliver different agents which can plug up or close the fistula, such as metal coils, plastic particles, glue-like substances, and occasionally stents or other devices. This kind of treatment usually involves several days of hospital stay. Finally, some dural fistulas can be observed conservatively, depending on factors such as size, location, and overall patient condition. The details of any treatment are best discussed with the specialist performing the procedure. Sometimes, catheter embolization is not possible for various reasons. In these cases, a highly precise form of radiation treatment (usually gamma-knife) can be used to target and close the fistula. Radiation treatments take time to work (usually 1-2 years and sometimes longer) but can be remarkably effective at safely and effectively closing very complicated fistulas for which no other treatment exists. Again, the details of treatment are discussed with the specialist performing the procedure. Prognosis depends on symptoms and degree of dysfunction. 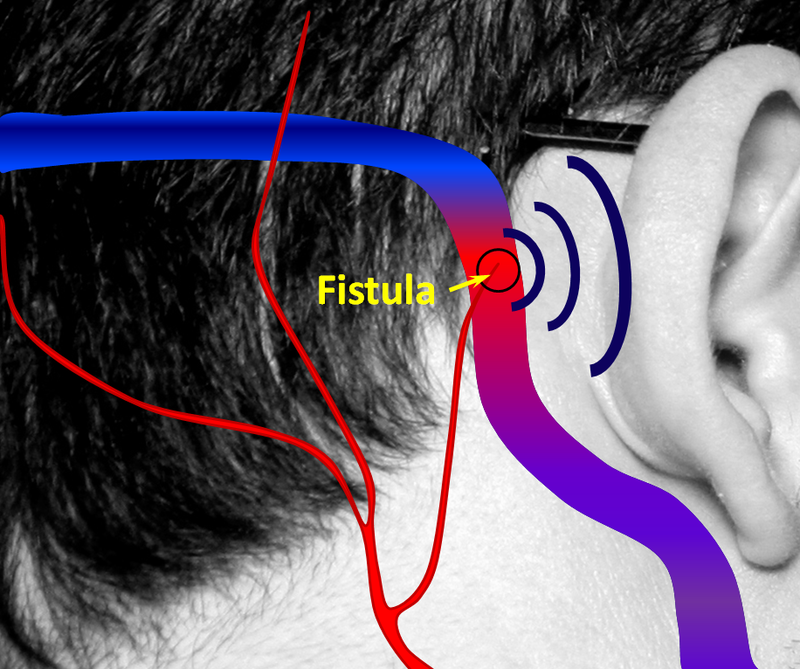 Pulsatile tinnitus that is caused by the fistula is permanently cured by closing the fistula. Eye problems are usually completely cured or made much better. Seizures often stop or markedly improve. Strokes already caused by the fistula cannot be cured, but new dysfunction can be prevented. Ultimately, prognosis is established individually based on the kind of fistula the patient has. Our neurointerventional group specializes in angiography and embolization of brain vascular malformations, including brain dural fistulas, where we have extensive experience. As all centers of excellence, we function as part of a group of neurosurgeons, radiation specialists, neurologists, and other physicians and support staff. We are located at NYU Langone Medical Center, in New York City. You can reach us by filling out the “Contact Us” section or by calling the office at the number provided in the contact section. 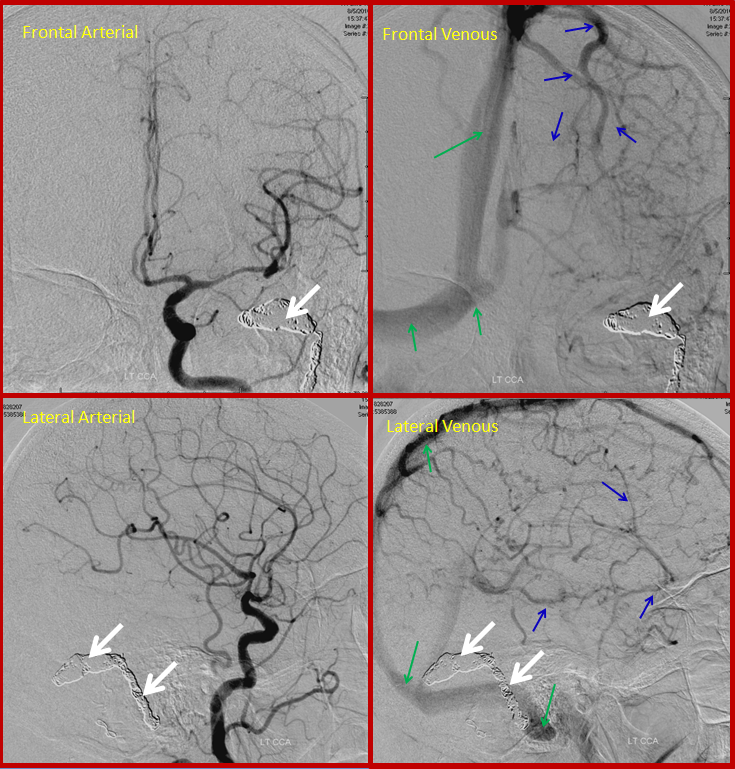 For an in-depth presentation on treatment of Brain Dural AV Fistulas, primarily geared towards neurointerventional professionals, you can visit Techniques: Brain Dural AV Fistula Embolization page. Below are pictorial diagrams of what a fistula is like and how it can be treated. The actual anatomy is much more complicated, but the pictures provide a frame of reference. 1. Normal Situation — a big vein (actually dural sinus vein) runs in the back of the head, with part of it close to the ear. All kinds of arteries are also present in that area. Normally, arteries and veins do not communicate directly. 3. The most common way to treat a fistula is to stuff the vein (or venous sinus, in this case) with many metal coils. This is usually very effective at curing the fistula, though it sacrifices the vein. Most of the time, sacrificing the vein is still a much better option than living with the fistula. 4. Occasionally, the vein can be preserved by plugging up the arteries and fistula with glue, while keeing the vein open. Because the fistula is usually much, much more complex than this picture, this only works in minority of times, even though from the picture it looks easy. The exact treatment strategy depends on each individual’s anatomy and preference of the treating physician. 5. Fisulas can also be cured with a special kind of highly targeted radiation (gamma knife) which delivers very high radiation doses to the fistula and very low doses to everything else that’s nearby (such as the brain.) This kind of treatment is usually used for very, very complex fistulas which cannot be cured by other means, or for fistulas in very senstive locations (such as near the middle of the brain) where other treatments are felt to be more risky than radiation. Radiation treatments are painless and highly effective, but are only available at select centers where both machinery and expertise are present, and carry a small but much feared possibility of radiation after-effects. Patients with dural fistulas tend to be relatively young, and therefore are expected to live for many years following treatment, which increases the possibility of delayed radiation issues. This kind of treatment is relatively new, and long-term effects are not known with certainty, although the overall long-terms risks are likely to be quite low. 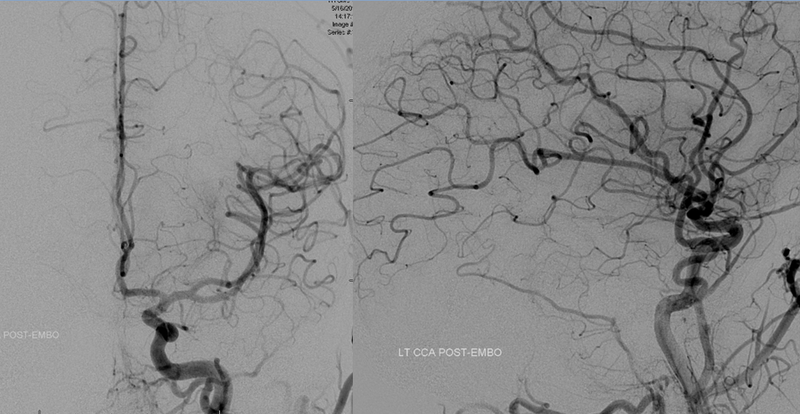 Below are catheter angiogram images of a patient with sigmoid sinus dural fistula before and after treatment. The patient complained of pulsatile tinnitus (whooshing sound in the ear, which was synchronous with her pulse) for several years before the diagnosis was made. The fistula could be clearly heard over the mastoid bone (behind the ear) with a stethoscope. BEFORE TREATMENT: The top row of images is looking at the head from the front (image on left has bone structures for reference). Images on bottom are looking at the back of the head from the side. The location of the ear canal is marked with white arrow. 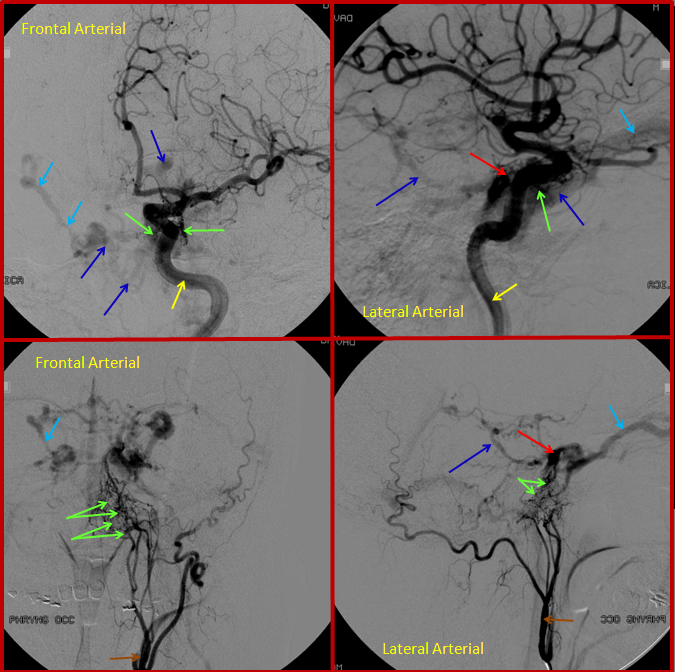 The fistula (red arrow) is supplied by many small arteries (brown arrows) coming from an artery in the back of the head called occipital artery (purple arrow). The fistula empties into the sigmoid sinus and subsequently internal jugular vein (blue arrows). This patient suffered from pulsatile tinnitus because of proximity of the fistula to the ear structures. Most patients with fistulas near the ear have pulsatile tinnitus. AFTER TREATMENT: This patient was able to be treated with preservation of the sigmoid sinus. The sinus was kept open by placing a stent (yellow arrows) into it, and injecting a glue-like substance into the arteries feeding the fistula. 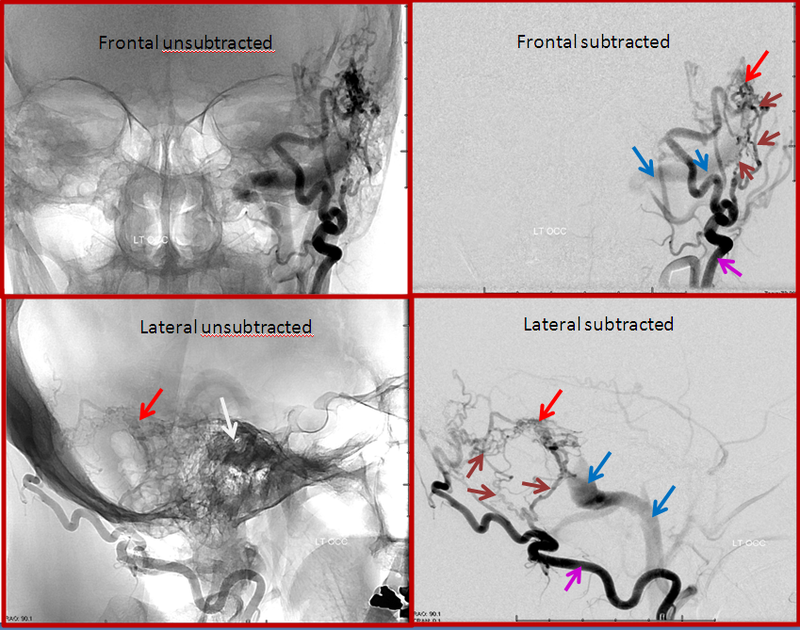 After treatment, no abnormal vessels are seen where the fistula used to be (red arrows) and the sigmoid sinus remains open (blue arrows). BEFORE TREATMENT: Simiar to case 1, but somewhat bigger fistula. The top row of images is looking at the head from the front (image on left has bone structures for reference). Images on bottom are looking at the back of the head from the side. The location of the ear canal is marked with white arrow. 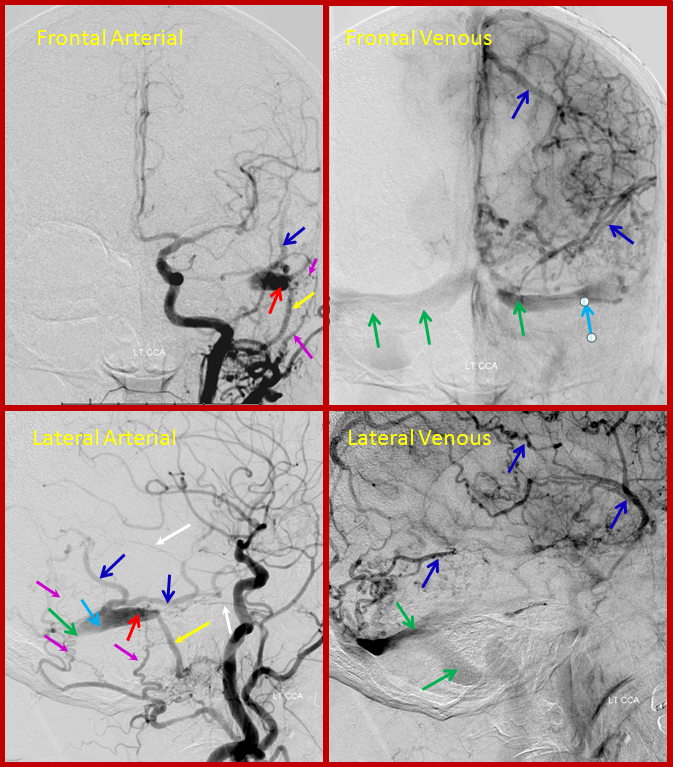 The fistula (red arrow) is supplied by many small arteries (brown arrows) coming from an artery in the back of the head called occipital artery (purple arrow). The fistula empties into the sigmoid sinus and subsequently internal jugular vein (blue arrows). This is a more advanced kind of fistula, where main venous outflow from the fistula closes down (by angiopathy and thrombosis) and the fistula starts flowing up into the brain veins instead of down into the neck veins. This is obviously problematic, because brain veins are designed to handle brain blood flow and volume instead of the fistula. The brain becomes congested (swollen) because it cannot adequately drain itself. This is how fistulas, percieved by many as merely annoying (in terms of tinnitus) or medically manageable (headaches), evolve into serious and potentially life-threatening situations. Brain congestion can (and often does) lead to seizures, strokes, and bleeding (hemorrhage) into or around the brain, all major problems for obvious reasons. Many other symptoms are reported, as common as headaches and mental decline, and as strange and unusual as major psychiatric disorders. Curing the fistula at this point can cure or signficantly improve epilepsy and other issues, but consequences of established strokes and brain bleeding are usually permanent. However, even at this stage the patients may be relatively well off, as this elderly woman who complained of pulsatile tinnitus and headaches, with no other issues. This patient came to the hospital with a bulging, red, swollen left eye, and was subsequently found to harbor a large and complex, high flow cavernous sinus dural fistula. Cavernous sinus is a large venous lake behind the eye, and fistulas there cause eye problems just like fistulas near the ear cause tinnitus. Most fistulas in the cavernous region are what’s called carotid-cavernous fistulas, which is a direct communication between the carotid artery and the cavernous sinus. However, in this case it was a dural fistula type, supplied extensively from external carotid and internal carotid dural branches. The fistula (approximately located where red arrow points to) is supplied from innumerable branches (green) of the external carotid (brown arrow) and internal carotid (yellow arrow) arteries. 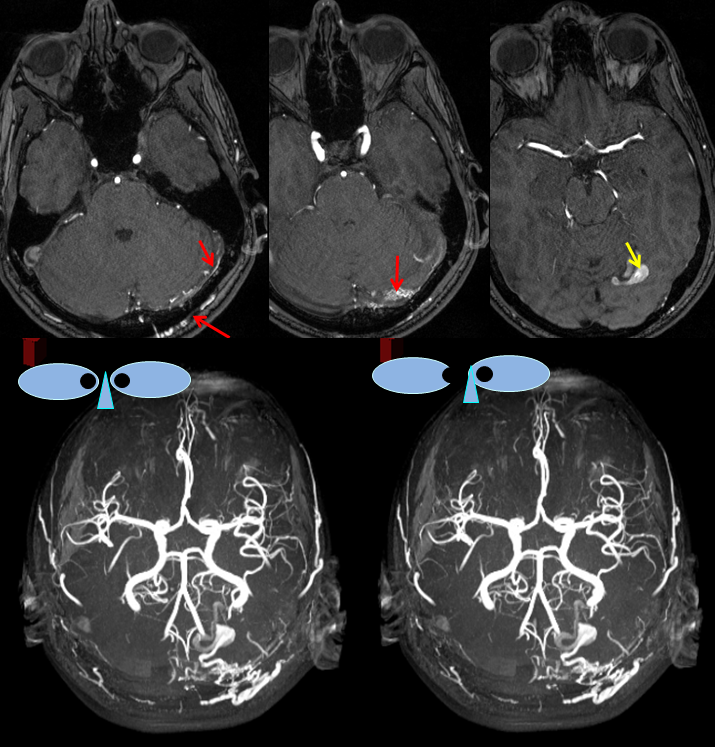 Many veins are seen, including an ophthalmic vein (which is the vein in the eye socket, light blue arrow) and deep veins of the brain (pink arrow) and cavernous sinus region veins (dark blue arrows). Because of congestion in the ophthalmic vein, the eye becomes swollen and red. After glue injection into a relatively promising arterial feeder, the fistula is still “alive”, though the flow through it has diminished. Thus, veins (dark and light blue arrows) are still seen too early on the pictures below, where only arteries (green, brown, yellow arrows) should be visible. The remaining fistula (red arrow region) cannot be embolized through the myriad tiny feeding vessels (green arrows). Just like in case 3, the next option is to treat the fistula by putting coils into the vein, which in this case means cavernous sinus (the venous lake behind the eye). Usually, it can be entered through the jugular vein in the neck, however in this case this road was not feasible. Therefore, the ophthalmic vein was entered directly by making a small incision above the eyelid and passing a cannula into the vein, followed by a small guidewire (black arrows, see top picture below). 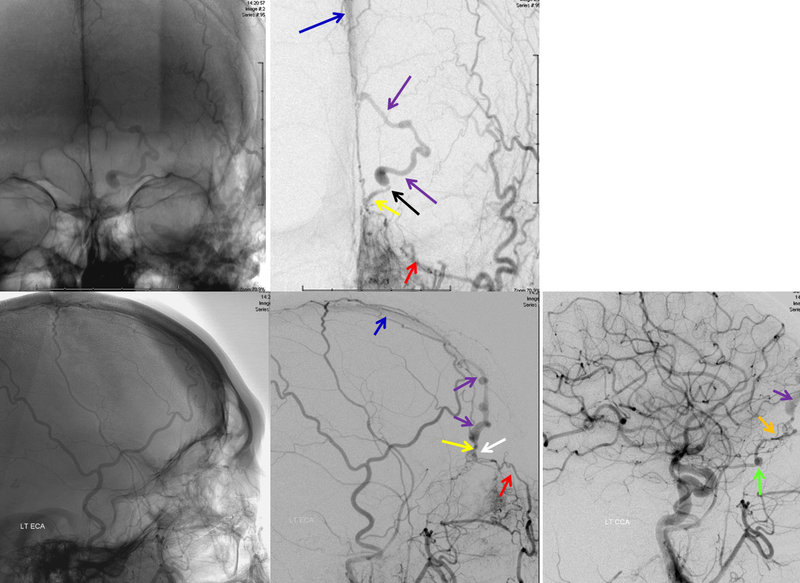 The middle set of pictures show the wire in the cavernous sinus. 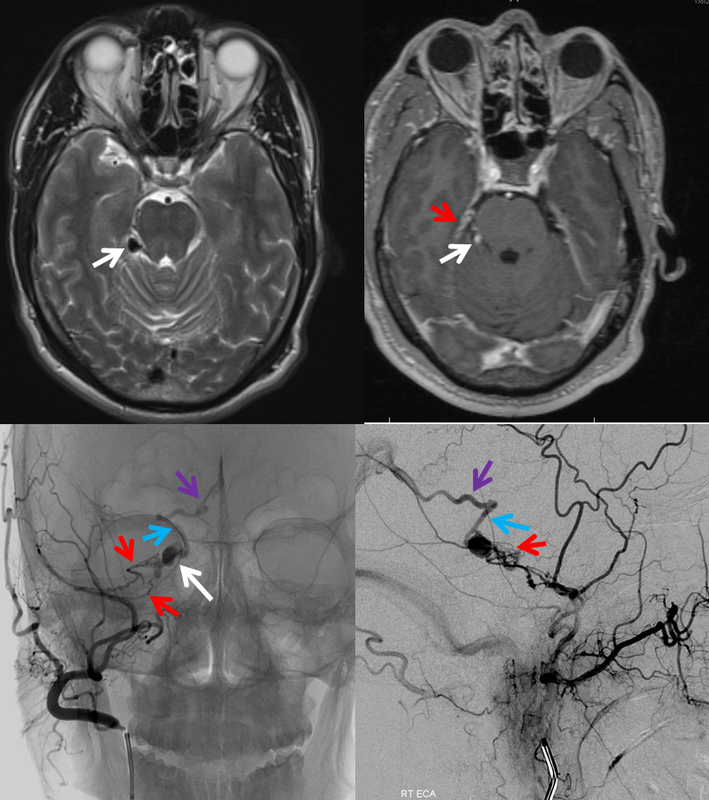 The bottom picture is venogram obtained by directly injecting the cavernous sinus to demonstrate the basal vein (dark blue) and ophthalmic vein (light blue arrows). 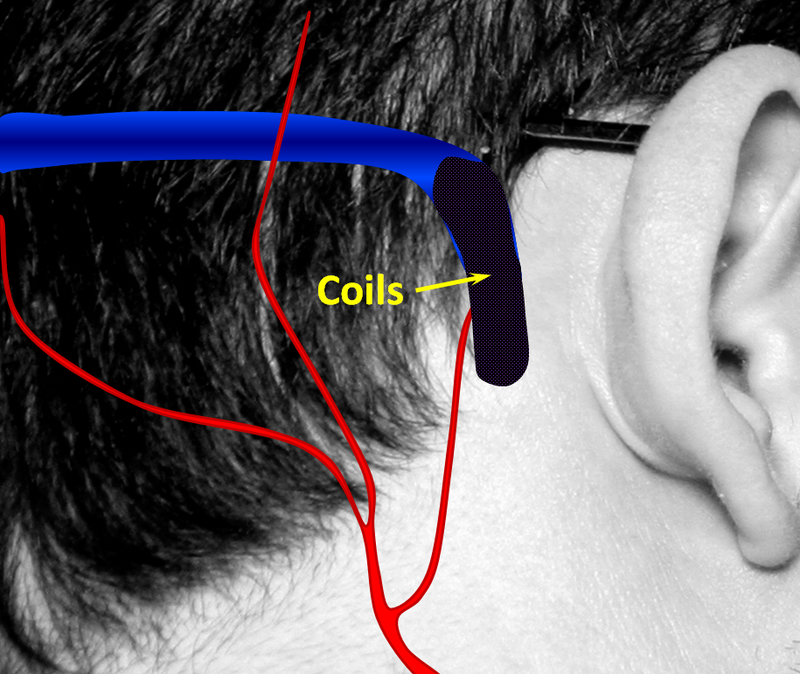 Some coils have already been placed into the sinus. 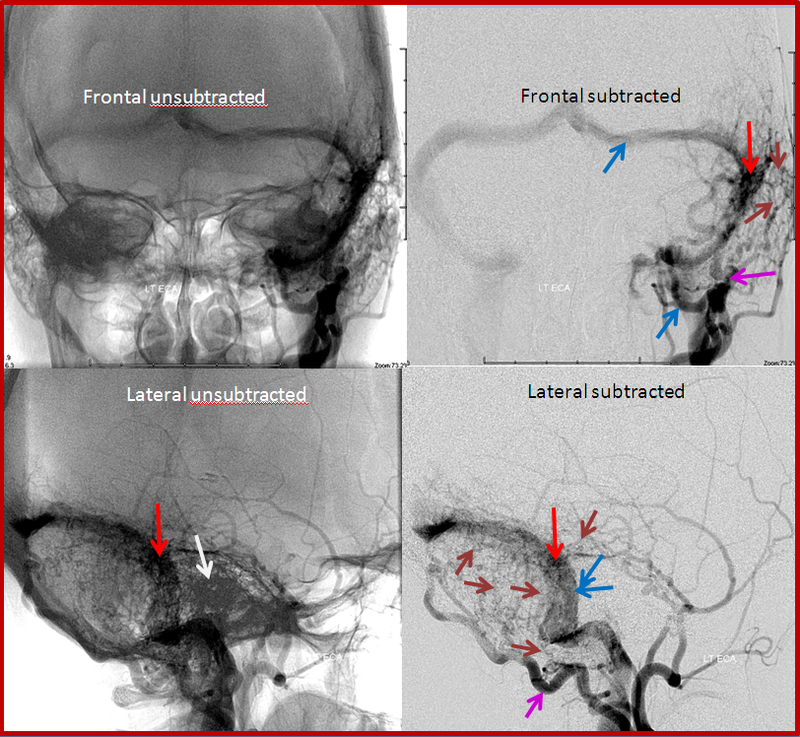 Finally, post-embolization views, showing the coils in the cavernous sinus (white arrows) and no evidence of fistula on injections of the external carotid artery (brown arrows). This approach, though technically challenging, can be quite successful when other venues prove unfeasible. This patient developed a fistula on the dural covering that separates the back part of the brain, called cerebellum, from the overlying occipital lobe. The fistula is far away from the middle ear cavity, and there was no tinnitus. 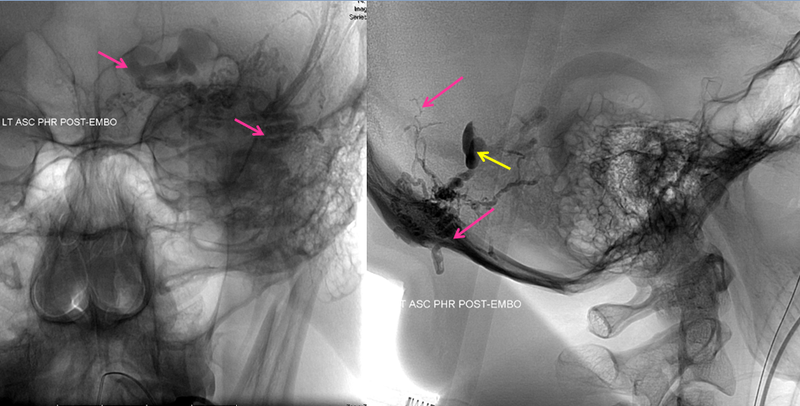 MRI images of the brain, showing the aneurysm (yellow arrows) associated with the fistula (because of high flow, vessels around the fistula may form these kinds of aneurysms). 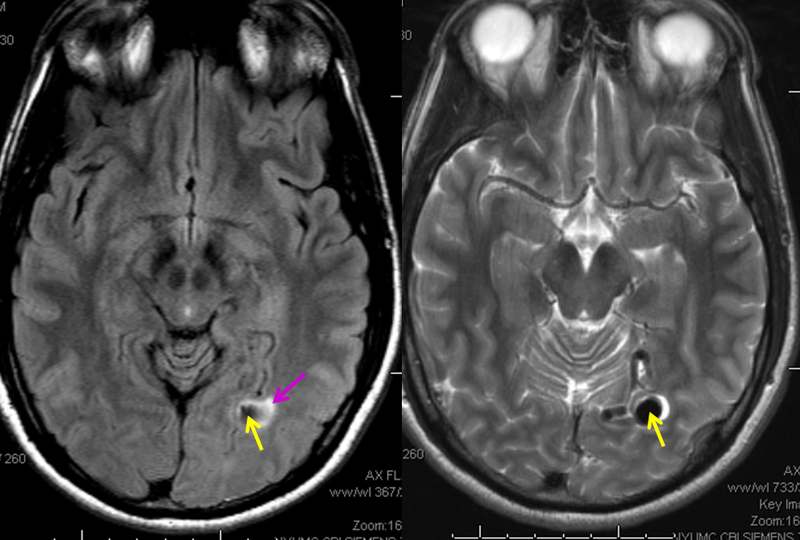 There is edema (swelling) present in the surrounding brain (pink arrow). The patient came to medical attention after developing a seizure which was preceeded by a visual disturbance. The location of the aneurysm, in the occipital lobe of the brain (which is responsible for processing of visual information) strongly suggests that seizure was caused by presence of the aneurysm and secondary local brain swelling. 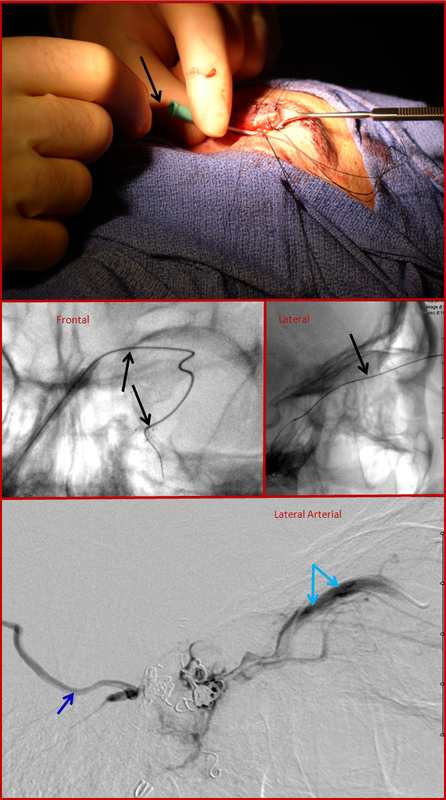 Angiographic view of the right external carotid artery injection, showing small vessels leading to the fistula (just a hint of what’s ahead). The fistula is off to the left. 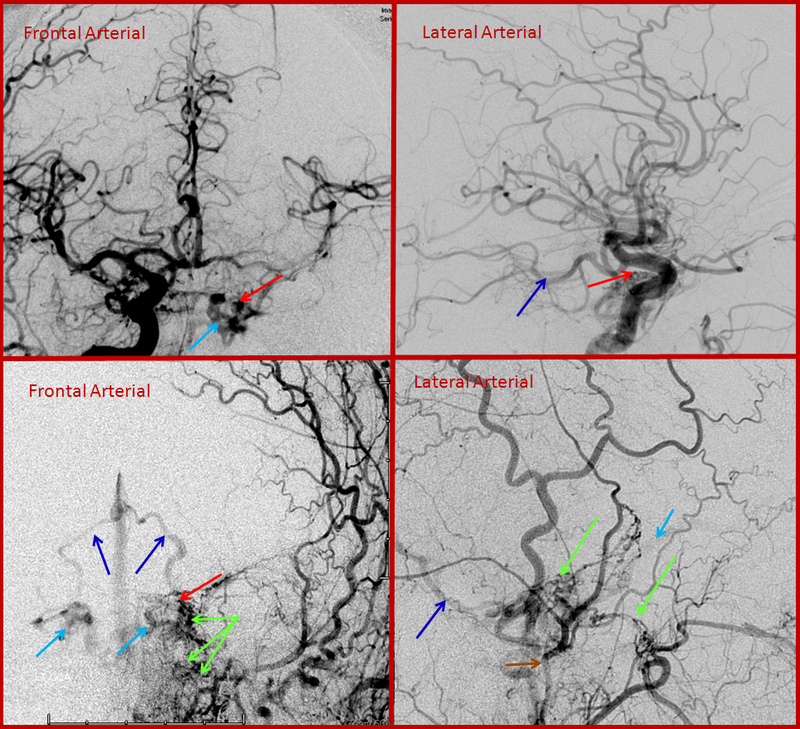 Finally, views of the left external carotid artery, showing more arteries feeding the fistula, incuding the occipital (red) and middle meningeal arteries (pink). The fistula point is marked in orange, and aneurysm in yellow. The goal of the treatment is to close the fistula by embolization with glue, making sure that the glue reaches the aneurysm (venous side). A microcatheter (white arows) has been navigated into a small branch of the middle meningeal artery, and the fistula (orange) is demonstrated from this position. An AVI movie of the same micro-injection is shown below. 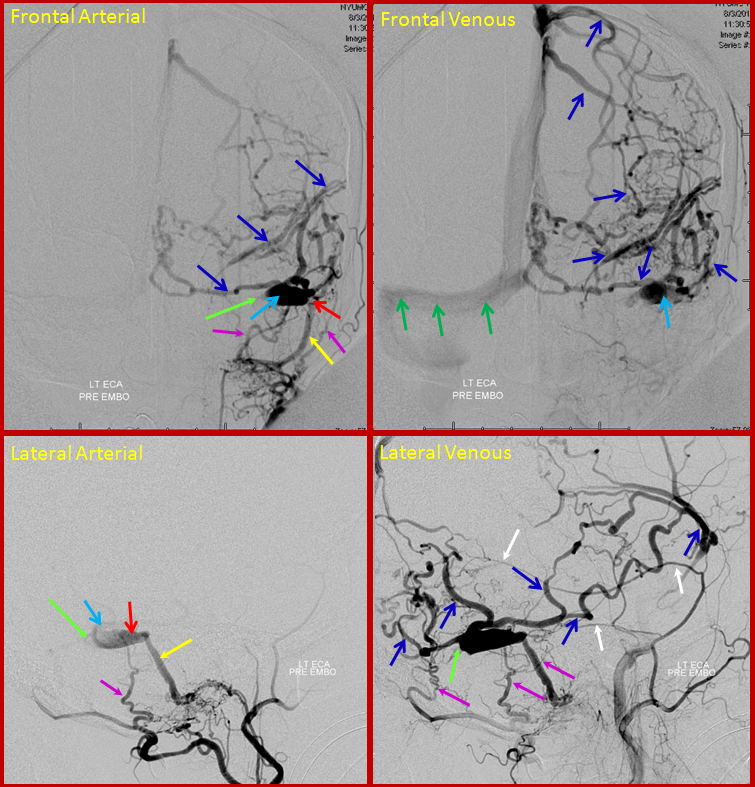 Cerebral angiogram of the same patient, with left external carotid AP (top) and lateral (bottom) projection injections, as well as lateral common carotid injection (bottom right) demonstrating the same angular artery (orange) and ethmoid artery (red) as seen on the MRI, supplying the common arterial trunk (yellow) of the fistula. Notice high-grade narrowing (black arrow) at the point of the fistula, where the artery traverses the cribriform plate. The narrowign is likely caused by the finite size of cribriform plate opening (foramen) transmitting the artery. A proximal venous farix (dilatation) is seen just above the black arrow. These dilatations are felt to represent one area of vessel weakness, predisposing to eventual rupture. The fistula ultimately empties into the superior sagittal sinus (blue). Notice a small aneurysm (green) of the intraconal ophthamic artery, which also supplies the ethmoid arteries. 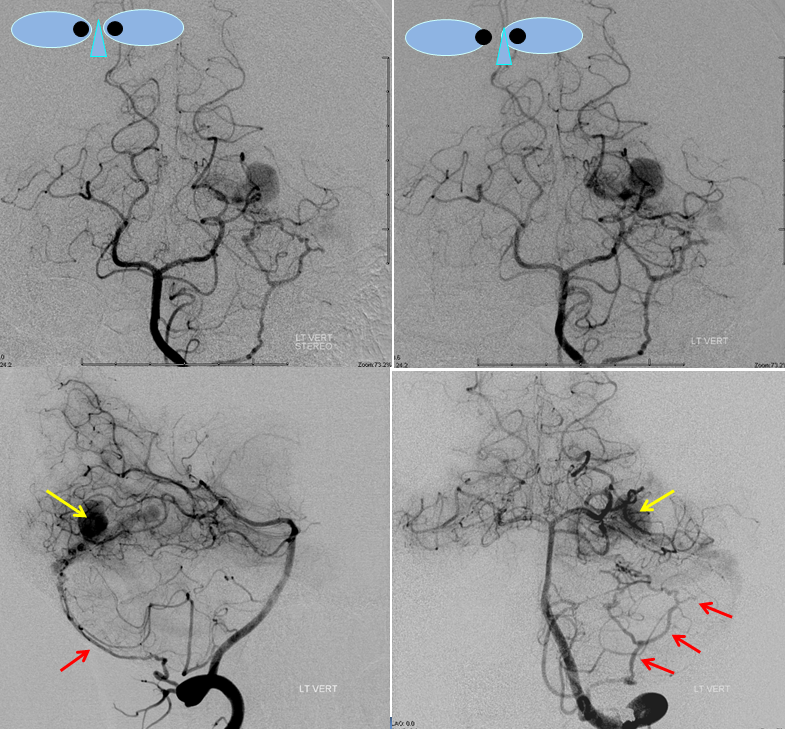 These “flow-related” aneurysms form as a result of increased fistula-related flow through arteries which were not designed to carry this volume of blood. This fistula was cured by surgical resection (prefered method of treatment for these particular fistulas at our institution). The surgery is performed via a small incision behind the eyebrow which minimizes scar formation. Summary: Brain dural arteriovenous fistulas (DAVFs) are abnormal, direct communications between arteries and veins located within the connective tissue cover of the brain called “The dura”. They are, essentially, short circuits between arteries and veins, bypassing normal circulation. The symptoms and possible problems caused by fistulas usually have to do with brain congestion, and vary depending on location and size of fistula, as well as the patient’s vascular anatomy. One of the most common symptoms is pulsatile tinnitus (PT), because dural fistulas of the brain are often located in the sigmoid sinus area, which is close to the ear. 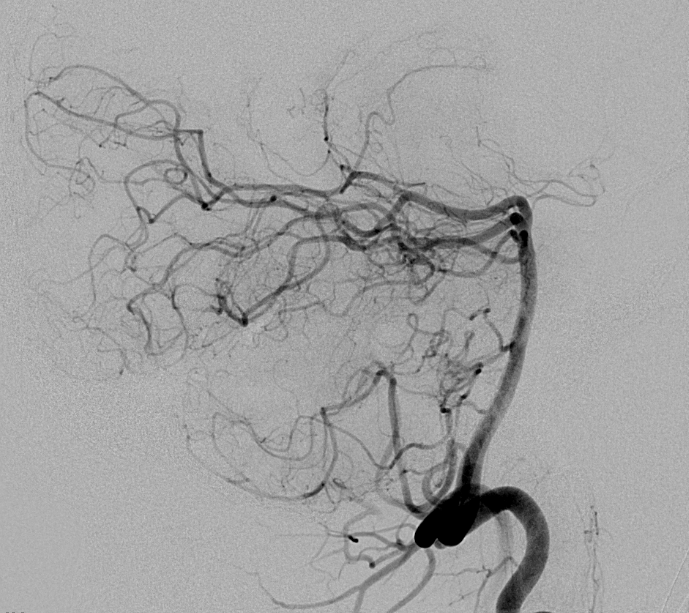 Diagnostic evaluation of the fistula involves performing a cerebral angiogram, among other studies. Treatment options and methods are varied, as can be seen above, depending on the kind of fisula, its anatomy, etc. Most treatments are done in an endovascular manner (through the catheters), but again depending on the fistula open surgery or stereotactic radiation may be the preferred way. Should you need more information, or if you are a patient wishing to make an appointment, you can write to me directly or call the office, both of which are listed in the “Contact Us” section.